I hope you like the colour brown, because it's the real star of this year's Madden 12 cover art, both versions of the game looking more like a Gears of War map than something from a game played on bright green fields. 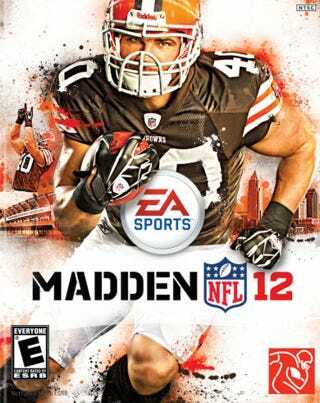 The regular edition of the game, featuring cover star Peyton Hillis, can't help it. He plays for the Cleveland Browns. Who wear brown jerseys. The game's Ultimate Edition (which includes a hand-signed card from the cover athlete), however, is graced by former Rams RB Marshall Faulk, and in an effort to make him look all Hall of Famey, he's been cast in Bronze. Well, he's had an awful Photoshop filter applied on an embossed cover, but the intent is there. This will be the second time Faulk has got himself on the cover of the game, having first appeared on Madden 03's box art in 2002.